Bucking the hobby trend for smaller scorers, Anthony Davis rookie cards are showing that big men can see strong collecting interest, as well. Sporting his trademarked unibrow, Davis is squarely among the elite young options for basketball collectors, and is expected to carry the league over the next decade. After one year under John Calipari at the University of Kentucky, he jumped to the NBA as the first overall pick of the New Orleans Pelicans in 2012. 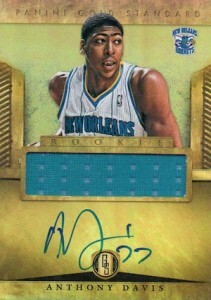 Soon after, Anthony Davis rookie cards got rolling and so did his All-Star career. Shop for Anthony Davis rookie cards on eBay. Issued in 2012-13 Panini basketball sets, Davis has a ton of first-year NBA cards, including many parallels, signed versions and inserts. 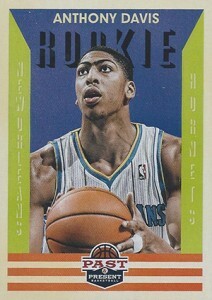 The following list includes all the official Anthony Davis rookie cards. Autographs naturally lead the pack, but there are multiple options at each price point. Full breakdown of Anthony Davis rookie cards. Anthony Davis 5 Card Rookie Lot (All Different Rookie Cards)! !